In the space of three studio albums and a little over six years, Parisian producer Erwan Castex, aka Rone, has evolved into one of mainland Europe's finest electronic artists. With a string of eclectic remixes, an impressive, hardware-focussed live show and a production credit for US indie icons The National to his name, Rone has cemented his reputation as a highly skilled producer. 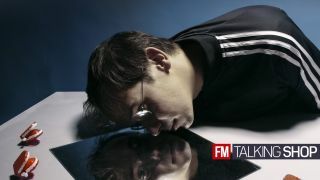 With his latest album, Creatures, on now via French label inFine, FM caught up with Rone to find out more about his approach to making music. "But the adventure really kicked off when I realised what one could do with a computer. All of a sudden, everything seemed possible! There wasn't this obligation to follow courses or to go to the academy! There were no rules; total freedom! I completely threw myself into it. Then I got interested in hardware, synths, drum machines and other machines - vintage or new." "For a very long time I made music at home. The advantage being that if I had an idea in the middle of the night, I could immediately jump onto my machines. And to quote Aphex Twin, it's cool to be able to make a record in your pyjamas. But a while ago I decided to move to a studio outside my home. I think it's important to put a bit of distance between the workspace and private life. Besides I've collected quite a lot of gear over the years, it takes up space. I use a lot of hardware to make my music, find new sound textures, melodies, then I edit all of it in Ableton. I use a lot of software too, mainly effects to take the sound further." "I'm very fond of Ableton Live. I sometimes use Cubase or Reason as well… But Ableton is so instinctive to me. It goes quicker. I control the interface with Mackie controllers for more comfort and sensations. I have several pairs of monitors to vary the listening and take a step back from my music (Dynaudio BM5, Opal Event), a few synths (Nord Lead 3, Korg MS20, Waldorf Q, Akai AX80), drum machines (Dave Smith's Tempest, Elektron's Analog Rytm). Sound card wise, I remain quite loyal to RME but recently I was given an Aurora LYNX that sounds great and has more inputs." "I can't really think of a particular piece. I'm not really a fetishist of machines and according to me, everything is replaceable. I actually like using different tools on each album. It helps me re-invent my sound. On my last album, Creatures, I really loved playing with the Nord Lead 3. That allows me to create mad sound textures!" "Clavia's Nord Drum 2, with its pad, because I like stepping out of the 'straight path' of machines and create a rhythm that's a bit more out of step, more lively. I use it in the studio to compose, but also on stage during my concerts." "I would love to create my own studio with modular synthesizers. There's one I dream of, Buchla's 200 System 7. I love the look of it, and the few demos I've seen on the internet really make me want to try it. But its price is crazy, so I think I'll probably go for a Music Easel, which already looks amazing." "In general I turn all the machines on, I hit record in my sequencer and I let myself go. I use my instinct. Most of the time I would start with a synth, for example the Nord Lead 3, I'll try to find some sort of melodic gimmick and a unique and particular sound texture. I record everything in MIDI because I sometimes switch to another synth while keeping a theme that I like, to see if I can't find a better sound texture. "Once I feel I've got something interesting, I generally add a bass line, then I focus on the rhythm part, with my drum machines. I set as many elements as possible on top of each other. Most of the time there is way too much stuff, then I start sculpting in all the matter I accumulated. I arrange the track focussing on the architecture. In parallel I start a sort of pre-mix. The real mixing starts later, when the track is properly structured." "I'm in a rather nice period at the moment, my album - which has just been released - is living its own life; people discover it, give me their opinion. It's funny because in a way my head is already somewhere else. I've started exploring new ideas for new tracks, I try things without really knowing how far I'll take them, or what I'll do with them. I'm also working on remixes, and I'll do a bit of production for very different artists, it's fascinating, it enriches my personal universe. Then I'd really love to put a foot back in my second passion, cinema. I get many scenarios and I think I'll do some soundtracks soon." "When composing music one sometimes goes through a slower phase where one feels a bit empty and it's difficult to make music. I think producing for others can be a good way to get back on track. I also have a simple and effective technique, to force myself to produce one track a day. Even if the result is bad, that little bit of self-discipline allows to free things up, and out of 30 tracks produced in 30 days, chances are at least one is a good path to explore. "That old saying is so true. The more I go on, the more I realise the same mistake I tend to make is to overdo it, to overload my sequencer with tracks and overload those tracks with effects. It's better to focus on very few elements and to push them to the limit. However, as I can't help but go through that phase where I try too many things with different instruments, different plugs gathered along the way, I've decided to split my production process in two steps: 1) I try out many things 2) I prune, I delete, I lighten. It's an important step that frees some space - on the hard drive, but also in the track itself." "I think what's really interesting in electronic music, and in music production in general, is that there's no rule. Everyone evolves their own way, and makes up their own methods. Of course it's important to learn from others to move forwards, and I sometimes watch tutorials on internet or ask fellow producers for advice to save time, but I like the idea of facing problems, to find answers on my own and develop my own work methods. I think it's the best way to find your own sound, or at least something original."